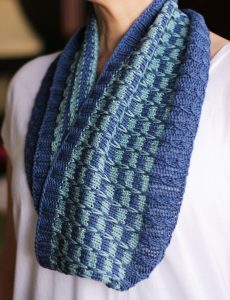 The Maritmus Cowl is a quick, yet impressive and simple knit! It can be worn in the spring or summer, or even the winter using a warmer fiber. It’s worked in the round using mock cables to start (no cable needle required), then graduates to a two color stripe slip stitch pattern. Cast on the amount suggested for single loop or double the amount for a double loop! Homework prior to class: Cast on and work rounds 1-3 of mock cable edge.